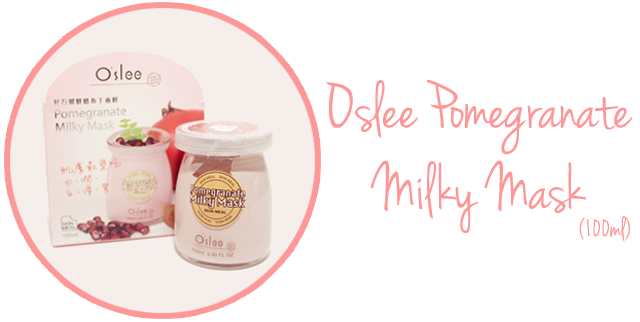 Would like to do a quick and easy review on O'slee Pomegranate Milky Mask. Well~~ If you're love visit pharmacies or drugstores, I bet this product seem familiar to you! Yup!! This product is one of the best seller product in MAJOR stores. Do you try it? Let's view my thought right now?! By the way, I will be giving away one set of O'slee Combo Set (Rosehip Hyda-White Cleansing Powder & Rosehip Beauty Solution Advanced Formula III) to one lucky reader at the end of the post. Keep reading yea?! O'slee Pomogranate Milky Mask contains a cute jar of mask, mask stick (spatula) for scooping purposed and cleansing sponge to remove away mask easily. O'slee Pomogranate Milky Mask come is a very cute design which in shape of 'JAR'. It reminds me of Aroma Oil Burner, lol. Besides that, I love when the package has comes with a stick aka spatula which makes progress easier and more hygiene instead of using hand when scooping out. For the cleansing sponge part, this tool really helps me alot because the texture of this mask hard to wash off if using bare hands. 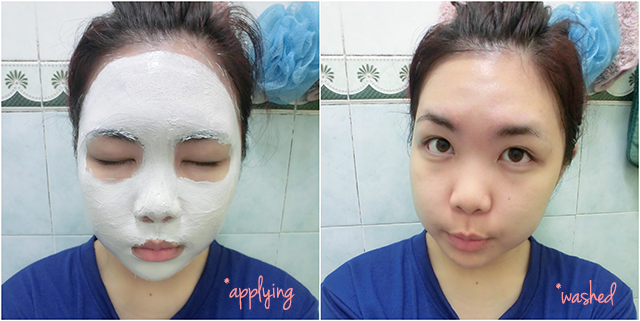 After cleansing, apply a thick layer of mask on face, rinse after 10-15 minutes. The texture of the O'slee Pomegrante Milky Mask is a cream type mask. It is very thick and creamy, kinda like stiff peak cream type. The scent has a light fruit berry kind but I believe is from Pomegranate fruit. It's so relaxing and tempting. When applying, is better go for thick layer covering whole face (except eyes area). This product doesn't makes my skin feel itchy or irritating. My skin feels warm (not cold or hot) and creamy. 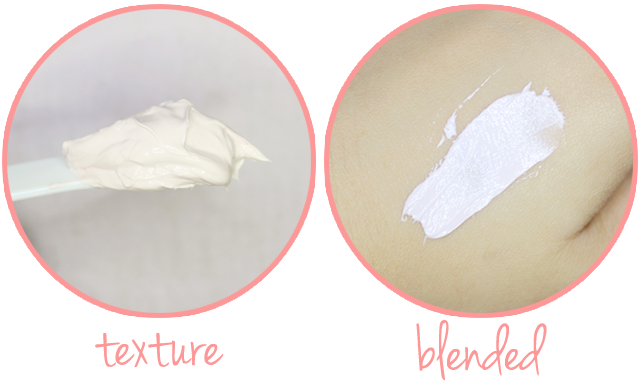 Because of the texture is super creamy so when you use your hand to apply, you might having problem when rising it off (just like when you washing off cream); is better using mask stick (provided) or mask brush brush to apply on. For the price fact, it is cheap and worth of buy!! This product contains 100ml and can use up to 20 to 25 times depend on size of face. My face is big therefore this product could service me for about 20 times so in average this mask only cost me RM3.00 for one application which is really cheap to me yet the results is efficient! The smaller face you have, the cheaper price per application. I will be giving out one set of O'slee Combo Set (Rosehip Hyda-White Cleansing Powder & Rosehip Beauty Solution Advanced Formula III) worth RM79.88 to one lucky reader. All you need is to fill your details in Rafflecopter below and complete all steps given. 1. Giveaway is open to Malaysia only. 7. Contest starts from today until 31th Jan 2014, 11.59pm. You are giving out one set of O'slee Combo Set (Rosehip Hyda-White Cleansing Powder & Rosehip Beauty Solution Advanced Formula III)!! Nice! Seems like I found another option of mask for my face! 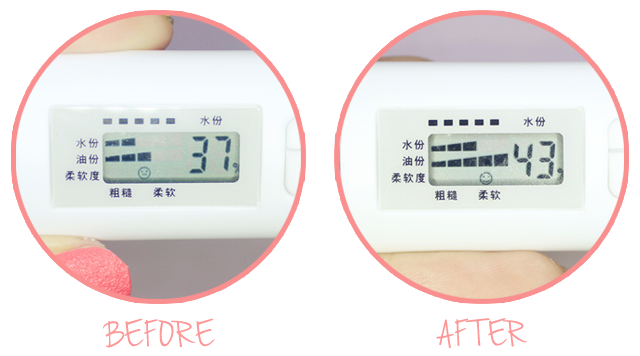 From your review, it seems suitable for sensitive skin too, double thumbs up! I've just started using their stuff and I'm loving it all! Thanks for the lovely giveaway <3 Have always been a great fan of O'slee, hope I can own the set! O'slee Combo Set (Rosehip Hyda-White Cleansing Powder & Rosehip Beauty Solution Advanced Formula III)! 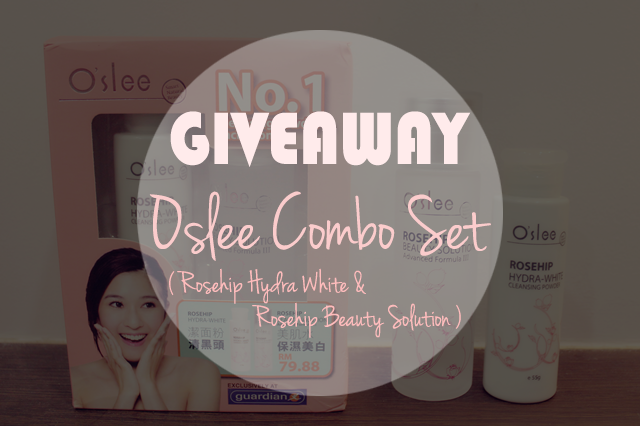 You are giving out one set of O'slee Combo Set (Rosehip Hyda-White Cleansing Powder & Rosehip Beauty Solution Advanced Formula III)! You are giving out one set of O'slee Combo Set (Rosehip Hydra White Cleansing Powder & Rosehip Beauty Solution) worth RM79.88 to one lucky reader.